How To Build The Leopard MBT Family In 1:35 A comprehensive guide to modelling this famous vehicle in its many forms. From battle tanks to recovery vehicles, homeland protectors, to battle-hardened veterans, you'll find much to enjoy and inspire within the pages of this exciting new book. 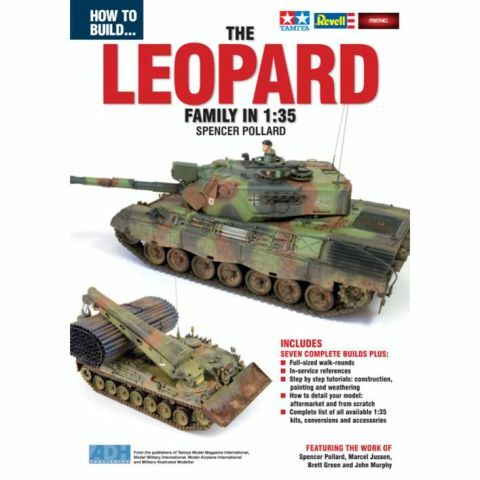 Along with the work of the author, you will also find guest features from Brett Green, Marcel Jussen and John Murphy, who's combined talents help tell the story of the seven models, including the Leopard MBT 1 A3, 2A4NL, 2A5, AEV, 2A6 and as a specially extended section, the incredible Canadian, C2 MEXAS. Each of the chapters tells the story of a model using in-depth construction and painting guides, as well as hints and tips on detailing, conversions, sculpting and figure painting. Add to that some exclusive, full-sized reference material and the reasons to add this book to your library, are there for all to see.